Monograms has created all-in-one packages a cut above going on your own, while leaving the group behind. Each package comes with hand-selected hotels, plus “they really do that?” service of a Monograms Local Host®-a local expert available throughout your stay. We’ve arranged sightseeing, exclusive to Monograms guests, complete with VIP access into some of the most incredible attractions (that means you skip the lines). We’ve arranged transportation and we offer a selection of special excursions. With Monograms, you travel in style independently without going it alone. Arrive in San José, where you will be met by your Local Host. This morning, transfer to the town of La Fortuna in the Arenal Volcano area, where you will stay two nights. This afternoon, visit the famous TABACÓN HOT SPRINGS and take a dip in the natural springs and pools of mineral waters surrounded by lush, tropical forest. Enjoy dinner at the hot springs. 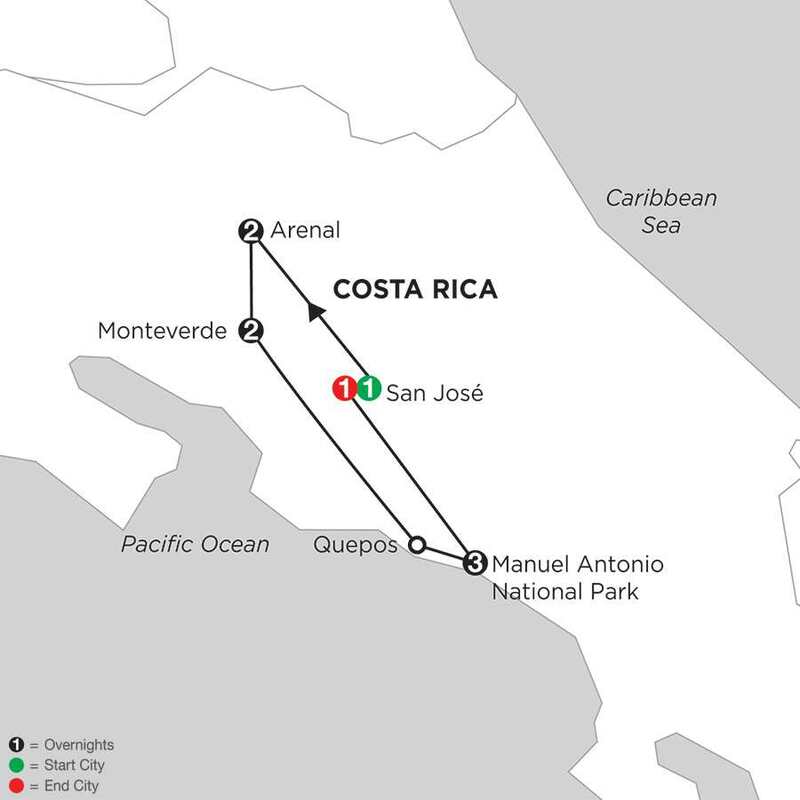 Today, transfer to one of the most popular destinations in Costa Rica, Manuel Antonio. This trip will take you through the scenic mountains toward the majestic shores of the Pacific Ocean. Notice the beauty of the landscapes and appreciate how vegetation and weather change from the dry forest to rainforest. In Manuel Antonio you will discover a beach destination that offers the opportunity to interact with Mother Nature in magnificent Manuel Antonio National Park. Enjoy a Naturalist-guided WALK on the trails of MANUEL ANTONIO NATIONAL PARK, considered one of the most beautiful areas in Costa Rica. It combines a beach of crystal-clear waters with coral reefs bordered by exuberant tropical vegetation and rainforest. Once in the park, your Naturalist guides you along different trails to observe the abundant flora and fauna of the tropical forest. In particular, several species of monkeys, iguanas, birds and possibly even the three-toed sloth can be seen. One of the trails borders Cathedral Point, where the view of the park and the sea is spectacular. During the afternoon you can relax at your hotel or you can participate in one of the optional activities offered in the area. Spend today exploring at your leisure. For the more active, consider a jungle hike suited to all abilities. Other activities include horseback riding, canopy tours, snorkeling, deep-sea fishing, and much more. Return to San José today. Exclusive: Book by April 30: Save $600 per person and air from $499! Exclusive $60 USD per cabin on board credit!